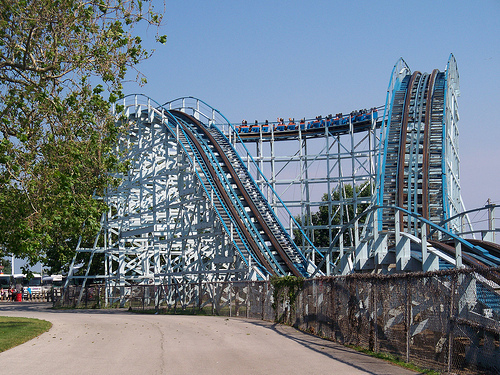 The Blue Streak was built in 1964. I wouldn’t rate it as being one of my favorite roller coasters. It is however a classic. The Blue Streak (followed by the Mean Streak) taught me that I’m not the largest fan of wooden roller coasters. The ride is rough though. I know a few people who absolutely love the Blue Streak. So don’t take any negativity from me as trying to bash the ride. It isn’t even my least favorite roller coaster in the park. It just isn’t something I would wait past 20 minutes to get on. The ride is a bit tamer than it was when I was in high school. In 1995 they changed the seats to have a single seat and a locked strapped down bar across your legs. Before this the ride had more of a sense of danger. If anything they tamed the whole thing down. The new seats (I’m referring to something as being new that is 17 years old….) with the bars are uncomfortable because of my height. The Mine Ride does the same thing to me, but I love the Mine Ride. So I’ll continue to long for the untamed years of the Blue Steak. I’m next to positive they will never revert the seats back. In the pre-1995 era the seats were a single bench seat. This meant that if you were riding with someone, around the turns you would slam into them (part of the fun). Across the laps of you and whoever you were riding with was a shared seatbelt. The and the seat belt made the ride a bit more intimate. It was also just a little bit awkward if you were riding with a stranger. I don’t remember the first time, but I think it might have been 1992 that I was taught how to take the ride to a whole new level. After you cleared the first hill you unstrapped your seat belt. At this point you were hanging on to the bar that came down (but didn’t lock in place) to do your best to stay in your seat. When you were hitting the hills you would literally fly up out of your seat. You never did this when riding with strangers. The whole negotiation of removing the only thing physically keeping you in your seat on a roller coaster would have been awkward. I can envision it now, “Yeah I want to make this a little more exciting – so would you like to risk your life with me?”. I’m sure some people have successfully made it through the conservation, but not me. My wife has said that was one of the favorite things she did in the park. She also has a higher rating for the Blue Streak than I do. I don’t think she will defend the Blue Steak to the death, but she would shed a tear if it was ever removed. The Blue Streak midway has already lost too many attractions over the years including the previously mentioned Star Voyager. In my next post I’ll be posting about of the rides nearest to my heart, The Paddlewheel Excursion.